A Thursday Valentine's Day makes Hollywood opt for an early start to the weekend, with four films getting their full debuts on the 14th, extending President's Day Weekend out to five days. Although there's romance a-plenty out there, the leading candidate for the top spot at the box office is Jumper, which boasts one of the most original looking premises for an action film in some time. A young man, played by Hayden Christensen, discovers that he has the ability to warp through space to anyplace he can envision. In addition to saving on air travel, he can also jump into the middle of a bank vault and clear it out without setting off alarms, so he's got that going for him. 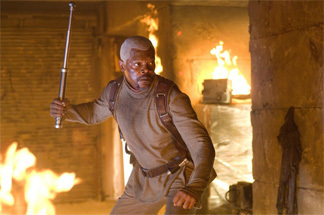 Soon he discovers that he's not the only person with this ability, and he's actually in the middle of a war between Jumpers and a society that is devoted to wiping them out, led by Samuel L. Jackson, sporting a shock white hairdo. Rounding out the cast are Rachel Bilson as the love interest, Jamie Bell and Diane Lane. Directed by Doug Liman, who brought us The Bourne Identity, Mr. And Mrs. Smith, and of course, The O.C., Jumper seems willing to have a lot of fun with the ramifications of its concept – that visual of a double decker bus appearing in the middle of the desert is a sign a screenwriter enjoying himself fully.